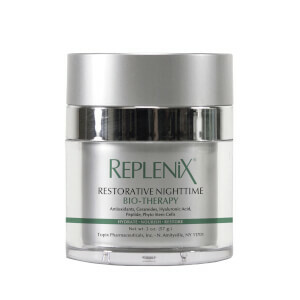 Replenix Power of Three Cream and Serum contain 90% Green Tea Polyphenols, Resveratrol and Caffeine U.S.P. Replenix Power of Three Serum is a lightweight, fast-absorbing formulation in a hyaluronic acid (humectant) base, while the Power of Three Cream is more emollient with a soy phospholipid and hyaluronic acid base. Patients can choose the formulation based on their own skin type and preferences. Anti-aging patients and those concerned about photodamage. Resveratrol is the antioxidant from red wine. 90% Polyphenol Isolates - the active ingredient in green tea containing the most antioxidant benefits including the compound EGCG. 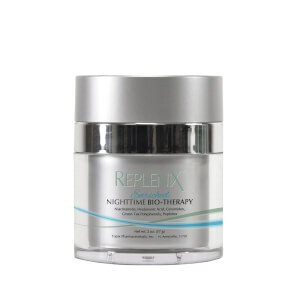 Anti-inflammatory - Calming and cooling to the skin, ideal for Rosacea and sensitive skin and post-procedure. 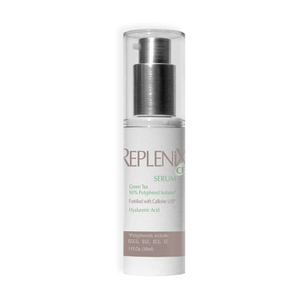 Replenix is a tan colored product due to the concentration of the green tea. Apply on clean skin once or twice per day. Can be used in conjunction with other skin care products. Very easy to apply and doesn't cause problems with other products, like my sunscreen. I love it!